Those who are familiar with this blog and my book on Kennesaw Mountain certainly know the name of Sam Watkins. In fact, many who have studied the war will easily recognize his name. Watkins was the author of one of the most widely read and influential memoirs of the American Civil War. His memoir chronicled years of marching, camping, and fighting with the Confederate Army of Tennessee in the war’s Western Theater. One of the most moving passages of that book refers to what happened 150 years ago today: the Battle of Franklin. 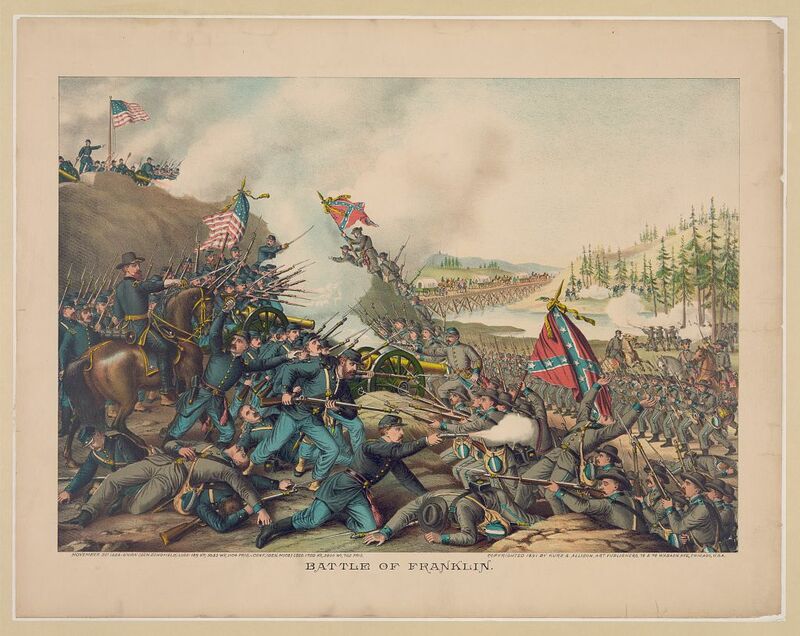 Franklin is a battle that lurks in the shadows of Civil War history. It does not enjoy the fame of Gettysburg, the notoriety of Antietam, nor even the attention of Shiloh. 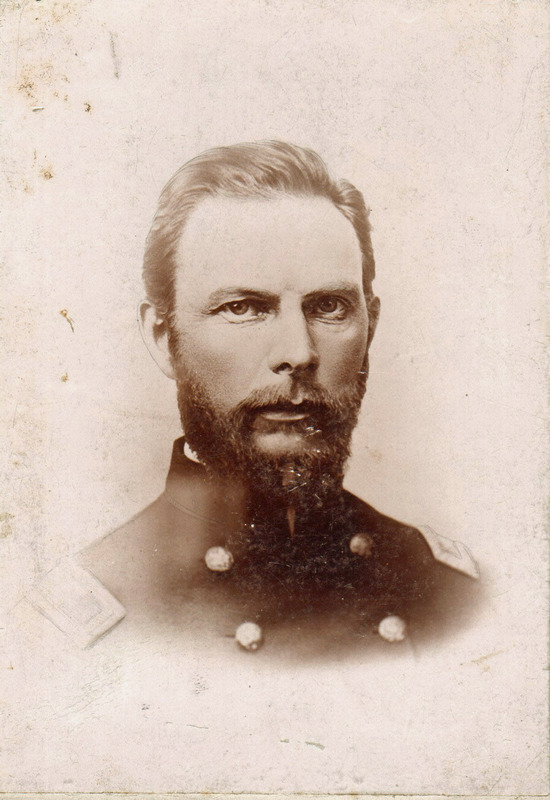 Franklin came during the final months of the war, and it featured generals such as John Bell Hood, Jacob Dolson Cox, John Schofield, and Patrick Cleburne. It was one of the final gasps of the Army of Tennessee, arguably the most overlooked army of the Civil War. The loss of precious battlefield lands to development at Franklin has surely hindered the popular understanding and memory of the battle, but recent efforts to reclaim those grounds will hopefully revive interest in this important battle. There are numerous sites that can provide much more detailed histories of the battle than I have time for here today. Among them are Kraig McNutt’s blog, The Battle of Franklin, and the Civil War Trust page on Franklin, complete with articles, battle maps, and information on how you can help to save and take back the Franklin battlefield. Suffice to say, there are many strong connections between the fighting at Kennesaw Mountain and the bloodshed at Franklin several months later. In just a few short hours, the Army of Tennessee lost over 6,000 in casualties. The number of losses for Confederates attacking at Franklin is comparable to Confederate losses during Pickett’s Charge at Gettysburg the year before. Among those slain were six Confederate generals. Of them, four–Patrick Cleburne, Otho Strahl, John Carter, and Hiram Granbury–were in command of Confederates on Cheatham Hill at Kennesaw Mountain just a few months earlier. One of the numerous Confederate commanders who was wounded at Franklin was Francis Cockrell, who commanded Confederate troops defending Pigeon Hill on June 27, 1864. While the Confederates were successful at Kennesaw Mountain, they had great tragedies and tremendous suffering ahead. Much of that suffering occurred 150 years ago today at Franklin. Of course, as has been noted, Sam Watkins was also at Franklin that day. Having experienced the Dead Angle at Kennesaw on June 27, 1864, and having written so graphically and emotionally about that action, Watkins’s description of the fight at Franklin is just as moving. Here are just a few lines from his discussion of what happened 150 years ago today. They highlight the difficulty many soldiers had in looking back on such difficult events from the war. Kind reader, right here my pen, and courage, and ability fail me. I shrink from butchery. Would to God I could tear the page from these memoirs and from my own memory. It is the blackest page in the history of the war of the Lost Cause. It was the bloodiest battle of modern times in any way. It was the finishing stroke to the independence of the Southern Confederacy. I was there. I saw it. My flesh trembles, and creeps, and crawls when I think of it today. My heart almost ceases to beat at the horrid recollection. Would to God that I had never witnessed such a scene! I cannot describe it. It beggars description. I will not attempt to describe it. I could not. The death-angel was there to gather its last harvest. It was the grand coronation of death. Would that I could turn the page. But I feel, though I did so, that page would still be there, teeming with its scenes of horror and blood. I can only tell of what I saw. 150 years ago today, William Tecumseh Sherman began his famed March to the Sea. 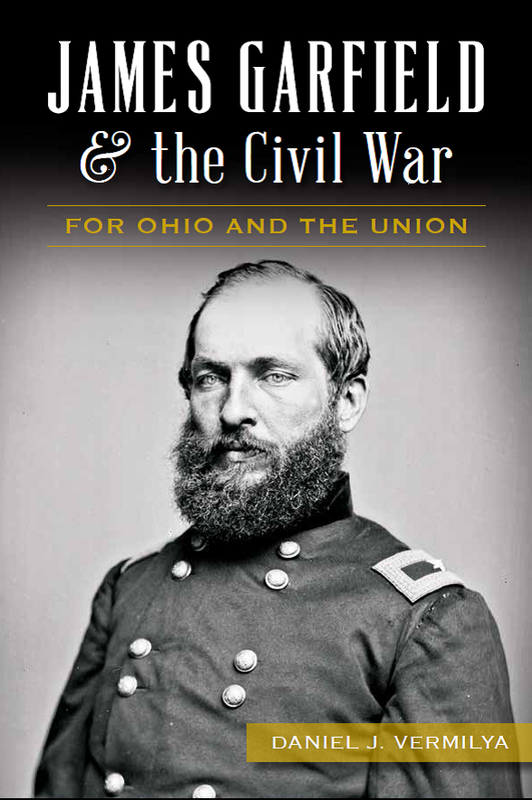 While much has been written about the March–and much is still to be written about it–I just wanted to share the thoughts of one Ohioan that were recorded on November 15, 1864. Albert Champlin was a private in the 105th Ohio Volunteer Infantry. His diary, preserved at the Western Reserve Historical Society, is one of the best accounts of the war that I have come across, and perhaps my personal favorite from my time researching. One of the reasons why I enjoy Champlin’s thoughts so much is that he was from Willoughby, Ohio, the town next to where I grew up. Another is Champlin’s continued focus on God in his writings, speaking of camp revivals, prayer services, and even his interpretations of the events of the war as though each day saw evidence of God’s existence and divine guidance. For Champlin, this meant that the destruction of Atlanta and Sherman’s success in Georgia were God’s way of punishing the Confederacy for its wickedness. Champlin’s words show a man of strong faith, believing in the righteousness of his cause. Clearly, much more suffering lay ahead for Champlin’s hope of victory blessed by God to become a reality, but through the difficulties of the Atlanta Campaign, seen at places such as Kennesaw Mountain, Champlin did not lose faith. With the fall of Atlanta, Union forces under Sherman were rewarded for their perseverance and tenacity that they displayed during one of the most difficult campaigns of the Civil War. I chose to open the introduction to my book with the scene of Atlanta burning and Sherman’s men marching onward on the night of November 15, 1864, because it seemed a fitting way to understand the significance of the Atlanta Campaign. It was a moment of total victory and triumph in Georgia; all that Johnston and Hood had defended for months and months during 1864 was being destroyed, and Sherman was headed on to destroy the heart of the Confederacy. None of that would have been possible without the sacrifices made and lessons learned at Kennesaw Mountain several months before. Champlin’s words remind us of the strong and abiding faith that imbued many soldiers with a sense of purpose and mission, that they were not only fighting for the preservation of the Union, but for a higher purpose in a righteous war. 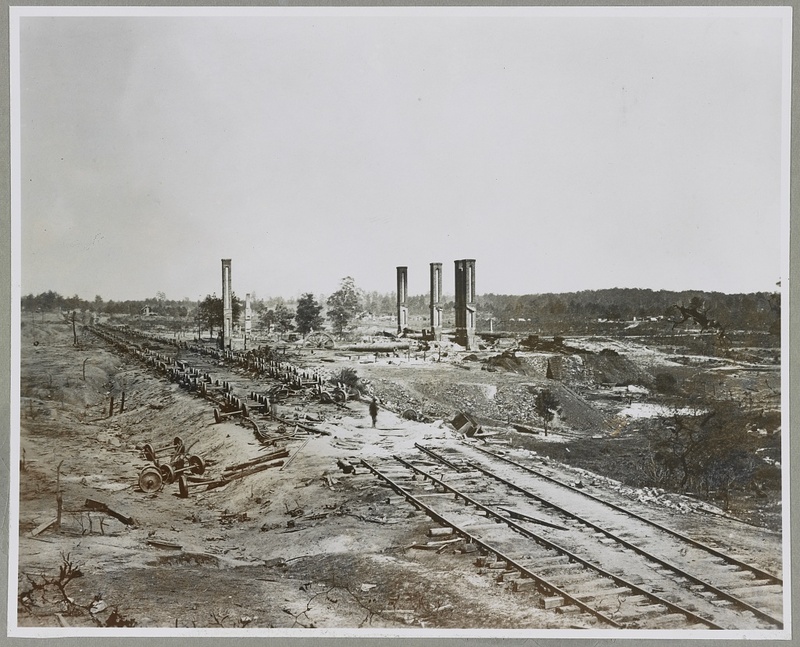 With such destruction in Atlanta and beyond, these feelings of righteous indignation were shared by many in the Union army who had struggled through the forests, swamps, and battles of the Atlanta Campaign, and emerged victorious on the other side. The war was not yet done, but it was entering its final chapters. 150 years ago today, one of the last great victories of the Civil War occurred. This was not a victory on the battlefield, but rather one at the ballot box. 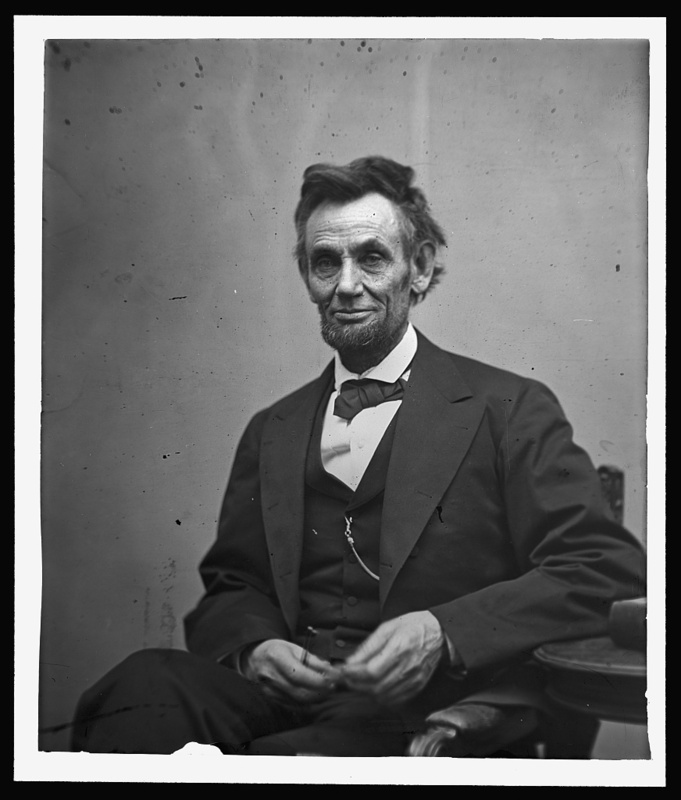 On November 8, 1864, President Abraham Lincoln was re-elected to his second term as the President of the United States, defeating Democratic nominee and former Union general George B. McClellan. Though Lincoln took 55% of the popular vote to McClellan’s 45%, the election was not as close as those numbers suggest. Of 233 electoral votes, Lincoln won 212. Lincoln’s party, the Republicans/Unionists, won 145 of the 185 seats in the House of Representative and 40 of the 52 seats in the Senate. From those wearing the Union blue in the armed forces, Lincoln received 78% of the vote, quite a feat considering the extreme level of loyalty and admiration which many soldiers felt for George McClellan during his tenure as General-in-Chief of Union armies and leader of the Army of the Potomac just two years before. While Lincoln’s November triumph was astounding, let us not forget that as recent as August 1864, the president was gravely doubting the prospects of his re-election, going so far as to discreetly ask his Cabinet members to sign a document declaring their unequivocal support for him and his efforts to win the war for the Union before the next president took office as a result of the upcoming election. Certainly, it is important to note that, despite the ongoing Civil War, the election of 1864 was not a military event. In a rarity in the history of mankind, a ruling party and leader caught in the midst of a popular rebellion taking hundreds of thousands of lives and threatening the very life of the nation did not use military strength to enforce their own political victory at the polls. Placed in context, many would not have thought it to be unreasonable to even postpone or cancel such an election in the whirlwind of civil war. Yet, Lincoln firmly understood the United States to be first and foremost a nation of laws and not of men. Thus, the election was held, and Lincoln was victorious. Even despite all of that, Lincoln’s political success 150 years ago today still would not have been possible without the blood shed on the battlefields of the nation. Without the sacrifice at places such as Shiloh, Antietam, Gettysburg, and the fields of the Atlanta Campaign, Lincoln and his government would have lost the war and the nation long before November 8, 1864. The blood shed at those places, and at countless others, afforded the country a continued existence and provided Lincoln a continued ability to lead the nation towards a better Union than had existed before. The Union soldiers in the ranks took note of all this in November 1864. The same men who had suffered through the long marches through Northern Georgia, through the dense forests of Pickett’s Mill and New Hope Church, through the trench warfare and frontal assaults of Kennesaw Mountain, and through the siege and battle for Atlanta, all realized that they too had a stake in the politics of 1864, for their combat record and suffering had made Union victory in the war possible. This day we pool our vote for Abraham Lincoln, the man who represents the principles of Liberty, of Justice, and of the Righteousness which exalteth a Nation, of Peace and good will to all men—that right may be the more firmly established forever in the land, and that it be a home for all men do we vote for Lincoln. Another soldier from the 105th Ohio–Albert Champlin–echoed Bliss’s words a few days later on November 11, once word of Lincoln’s massive electoral victory had reached the men in the field. Champlin, whose diary was filled with strong rhetoric describing the Union cause as righteous, believed that the victory of Lincoln and the Republicans was nothing short of a sign of God’s guidance of the nation. With Lincoln’s re-election 150 years ago today, once again, the United States had reached a turning point in the Civil War. There would now be no return to the nation that once was, and for the Confederacy, it would only be a matter of time until defeat would come. For the victorious Lincoln and the soon to be victorious Union, there was no turning back. Bliss Morse letter of November 8, 1864, in The Civil War Diaries and Letters of Bliss Morse, 165. Albert Champlin Diary, Alfred Mewett Papers, Western Reserve Historical Society, Cleveland, Ohio. 150 years ago today, Federal soldiers under the command of Major General William T. Sherman entered into the city of Atlanta, seizing one of the greatest prizes of the entire American Civil War. The ultimate Union victory in the Civil War was shaped and cemented by three tremendously important events occurring during the war itself. 1. The Battle of Antietam in September 1862 not only repulsed Robert E. Lee’s Confederate force from Maryland, thereby averting a crisis for Lincoln, but provided Lincoln a Union victory with which to issue the Emancipation Proclamation, arguably the single most important political event of the war. 2. The Union victories at Gettysburg and Vicksburg in July 1863 effectively broke the military back of the Confederacy. Vicksburg gave Federals complete control of the Mississippi, and Gettysburg bled Lee’s army to the point where it would never again be able to launch such an invasion of the North. 3. The fall of Atlanta, occurring 150 years ago today, was a debilitating blow to the South. It disrupted Southern rail transportation, Southern morale, Southern war making capabilities, and most importantly, signaled one of the greatest victories of the war just weeks before the 1864 presidential election. Countless historians have rightly attributed the re-election of Abraham Lincoln to the boost provided by the fall of Atlanta. In many ways, the events of 150 years ago today provided the final nail in the coffin of the Confederacy. The south was not yet dead; the events of Franklin, Nashville, and Petersburg would prove that Confederate forces still had plenty of fight. Yet, the fall of Atlanta signaled that the end was near. The goal for which Federals under Sherman’s command had been dying for over the course of several months had finally been reached. 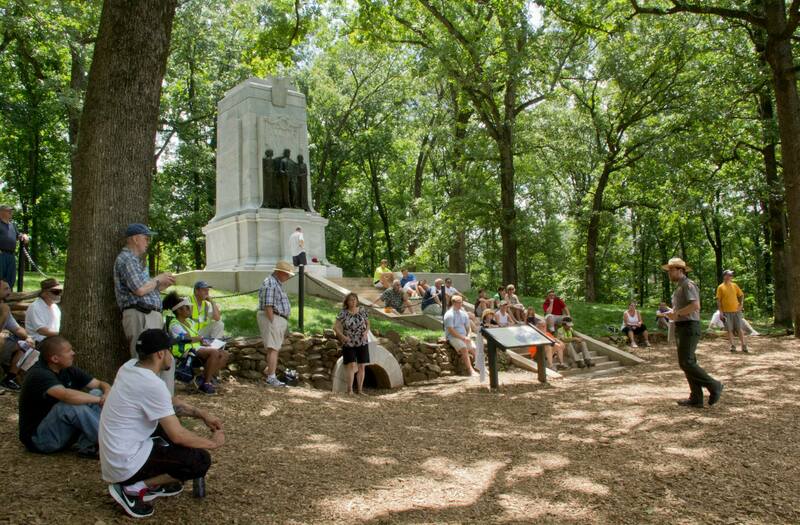 The men who had fought, bled, sweated, and died at places like Rocky Face Ridge, Resaca, Pickett’s Mill, Kennesaw Mountain, and Peachtree Creek, had all hoped for this day. Yet, despite the tremendous victory that had been won, there were more goals ahead, bigger and more important ones, ones that would ultimately secure the restoration of the Union, the abolition of slavery, and the opportunity to create an even more perfect Union. All that was just around the corner 150 years ago today. Amidst the fierce fighting on the morning of June 27, 1864, men of the 125th Illinois Infantry were being cut down by the dozen in front of the “Dead Angle” position in the Confederate salient. When brigade commander Dan McCook fell mortally wounded, Colonel Oscar Fitzalan Harmon assumed command, only to be killed himself a few minutes later by a bullet to the head. A quick look through Harmon’s pension file at fold3.com, courtesy of the National Archives, shows that he was much more than a colonel leading a regiment in an attack at Kennesaw. Like so many of these men, he was also a husband and a father. By adding just a few personal details on to his story, we can understand and appreciate his sacrifice so much more. Oscar Fitzalan Harmon was born in New York in 1827. His parents were Ira and Corrina Harmon, who lived in the northwestern part of the state. After working as a school teacher, Oscar began practicing law, being admitted to the New York bar in 1850. A few years later, he moved to Illinois, and met Elizabeth Catherine McDonald Hill, who was a young widow with two children from her first marriage. Oscar and Elizabeth were married on February 21, 1854. Presiding over their wedding was Enoch Kingsbury, a Presbyterian Minister, in Vermillion County, Illinois. One year later, almost to the day, Oscar and Elizabeth welcomed their first child. Lucy Bell Harmon was born on February 18, 1855. Two years later, Charles A. Harmon was born on October 21, 1857. Next up, Fanny D. Harmon was born on September 10, 1860, and rounding out the growing family, Corinne R. Harmon was born on March 15, 1863. Oscar enlisted in the Union army as the colonel of the 125th Illinois on September 4, 1862, in Danville, Illinois. Thus, he was already in the army when his youngest child was born in early 1863. On June 26, the day before the assault at Kennesaw Mountain, Oscar Harmon took the time to write home to Elizabeth. His letter is quite moving, as it displays his thoughts on the eve of his death, as well as his love both for his family and his country. Well dearest I must close in conclusion I must say, I still love you and think I am the most fortunate man in the world in having as good a wife. You have been very kind to me and more so if possible since I have been in the army. The remembrance of these things my dear one, as I pass along, affords me much kind happiness and my pleasure and when I look forward with a great deal of pleasure when kind providence I hope will permit us to see each other face to face. I feel if I escape this campaign that I am pretty safe. I have so far, for your sake been prudent and do not expect to be rash. It does not [s]how that a man is any braver than others who keep their places. If I fall, expect me to fall in my proper place. Then no blame can attach to me. Let us hope for the best, Kiss my darlings for me. Give my compliments to my friends. I am better along very well now. Had a potato this morning, it was glorious, and a pickle too. 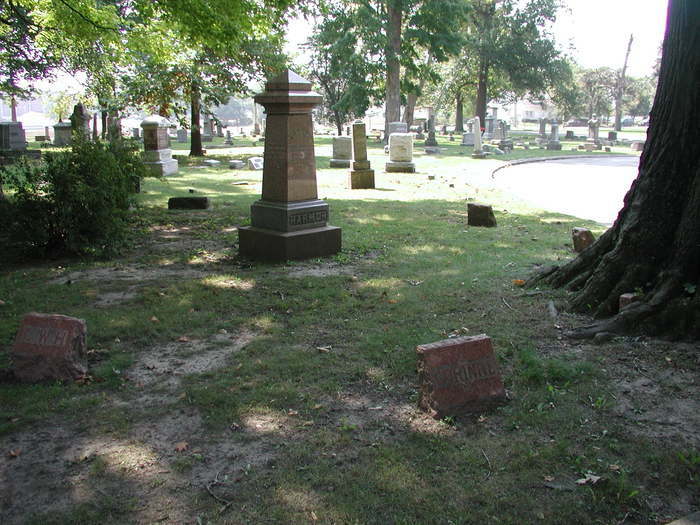 When Harmon was killed at the Dead Angle on June 27, 1864, it was a tremendous blow to his family and all those who knew him in Danville, Illinois. His remains arrived home a week and a half after the battle, and on July 10, a funeral procession was held, with a riderless horse, a special hearse and funeral march, and thousands of onlookers there to pay their respects. After Harmon’s death at Kennesaw Mountain, Elizabeth applied for a widow’s pension. In 1865, her pension was awarded at 30 dollars per month. Despite this money, Elizabeth was 41 years old and faced with raising four very young children on her own. She would experience heartbreak once more in 1871, when on March 19, her second child, Charles, passed away. What caused this death, the pension file does not indicate, but it was no doubt a terrible loss for a family which had already sacrificed a father and a husband on the fields of Georgia several years before. Note: The excerpt from Oscar Harmon’s letter to his wife on June 26 is found in Brad Quinlin’s latest book, “Under the Shadow of a Grim and Silent Kennesaw: Letters from the Kennesaw Mountain Battle Line,” published by Brad in 2013. 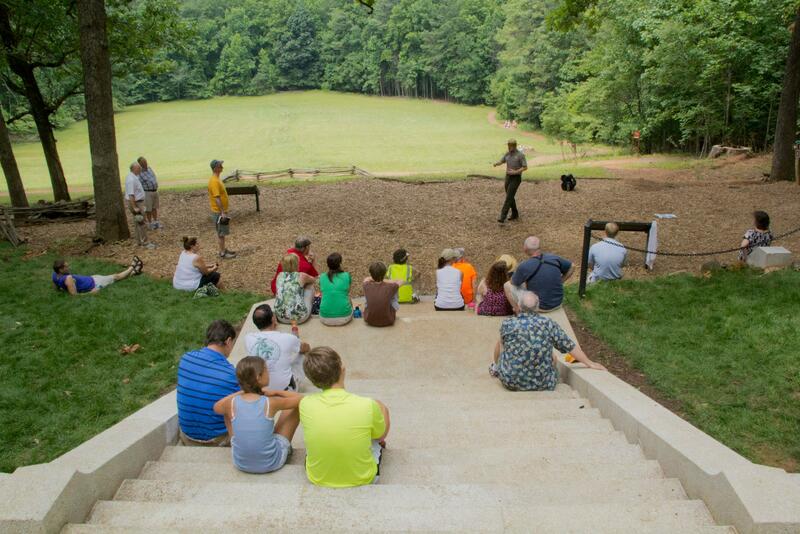 A few weeks back, I had the privilege of speaking at the Sacred Trust Lectures at Gettysburg National Military Park. 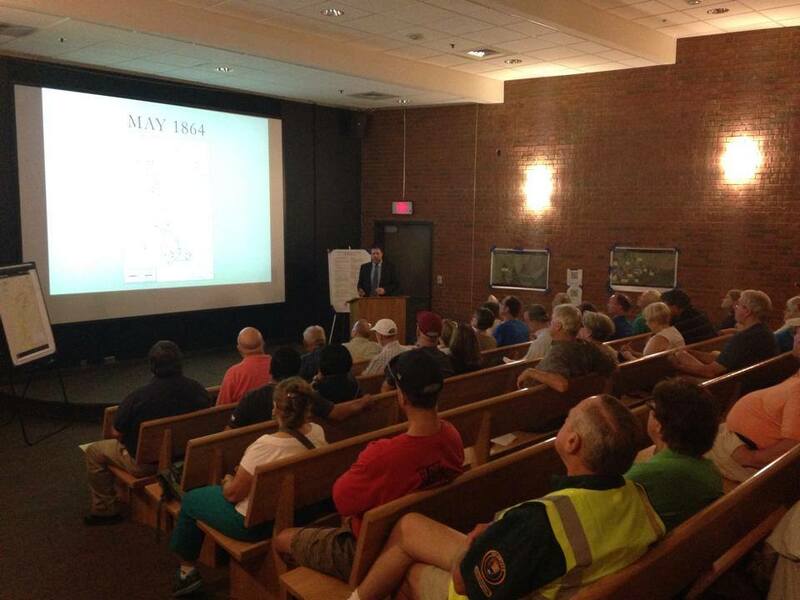 The folks at the Gettysburg Foundation who host these lectures every year do a tremendous job. This year, they filmed each of the programs, and have just recently put them up on youtube. 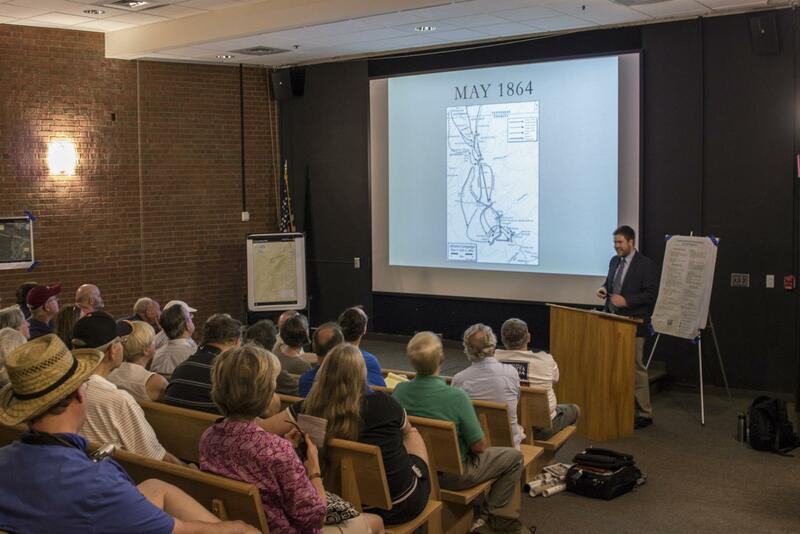 Below is the video of my talk on Sherman, Kennesaw Mountain, and the Atlanta Campaign. Hello all, just wanted to share that tomorrow afternoon, July 6, 2014, I will be speaking as a part of the Sacred Trust Lecture Series at the Gettysburg National Military Park Visitor Center. The program will be at 4:30, and I will be signing copies of my book beforehand at 3:30. I hope to see you all at Gettysburg tomorrow. I will be presenting a new program, focusing exclusively on William T. Sherman, Kennesaw Mountain, and the Atlanta Campaign. I will delve into who Sherman was, what he was trying to do during the Atlanta Campaign, and why Kennesaw Mountain was so important for what was one of the pivotal campaigns of the Civil War. Hope you are all having a wonderful Fourth of July weekend, and I hope to see you in Gettysburg! 150 years ago today, the United States–a nation mired in the fourth year of a bloody Civil War–was celebrating the anniversary of its independence from Great Britain. In the ranks of the vast Union armies fighting to preserve that nation, the significance of the day did not go unnoticed. On July 4, 1864, hundreds of thousands of Union soldiers were spread out across the Southern United States, occupying lands of the Confederacy in what was the final year of the American Civil War. Most notably, two Union commanders were on the precipice of seizing major southern cities. In Virginia, Grant was settling in near Petersburg, beginning a months long siege that would force he and his men to wait until 1865 until their goals of victory in the campaign for Richmond could be realized. 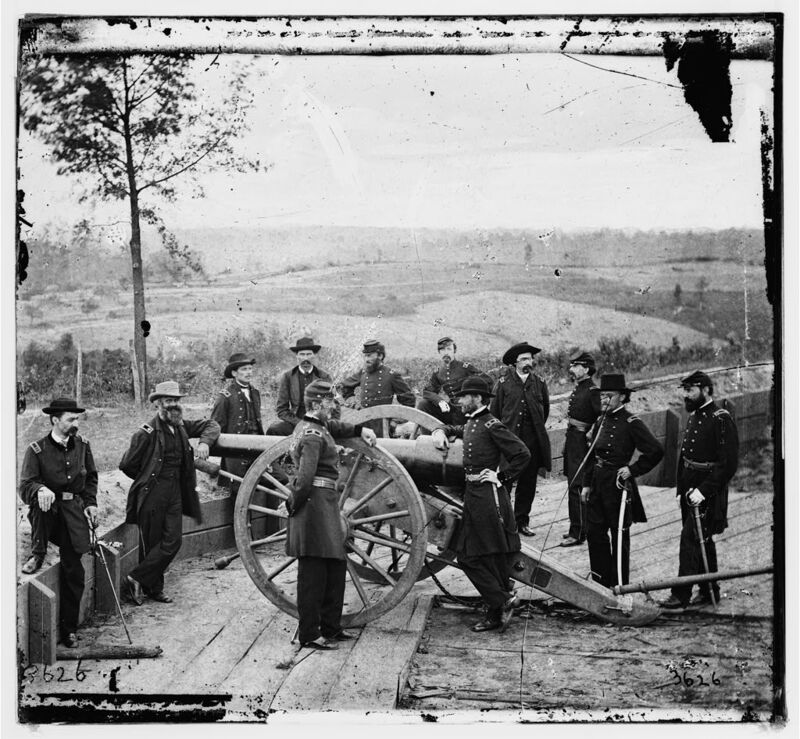 Far to the south, in the state of Georgia, William Tecumseh Sherman’s army group, consisting of the Army of the Cumberland, the Army of the Tennessee, and the Army of the Ohio, rested just miles from Kennesaw Mountain, the imposing height which had stalled Sherman for the latter half of June and the first several days of July. It had only been on the morning of July 3rd that Union soldiers discovered that Confederates had vacated their Kennesaw trenches, having been forced out by yet another flanking maneuver from Sherman. 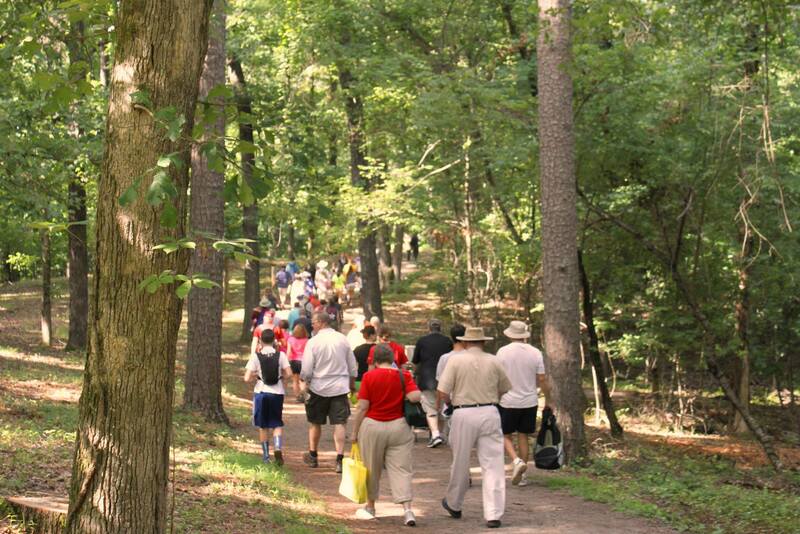 Kennesaw Mountain had been a resounding defeat for Sherman’s men, as each attacking column the Federals sent forward on the morning of June 27, 1864, was handsomely repulsed. Yet, one week later, the Confederates had retreated, and the Union soldiers who had seen their comrades slaughtered in such great number in front of the Kennesaw Line were preparing to push for the Chattahoochee River and toward Atlanta itself. Thus, 150 years ago, Union soldiers had cause for both sadness and gratefulness, for both remorse and relief. 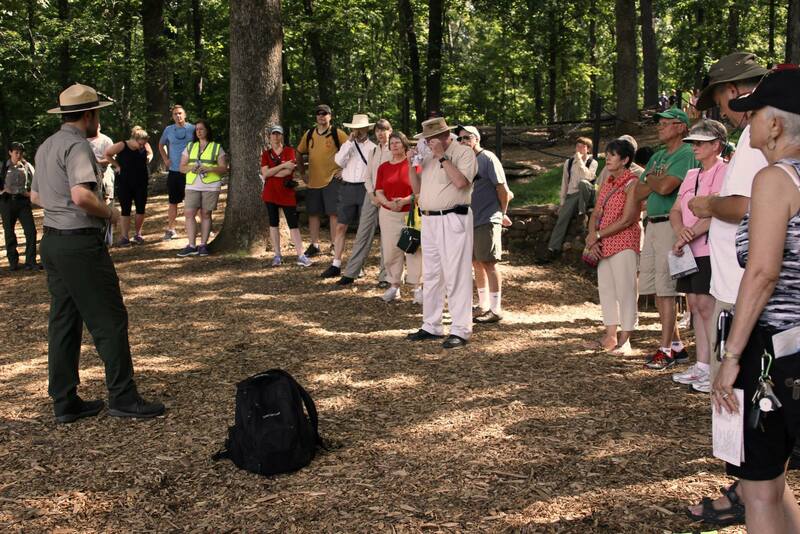 The troubles of Kennesaw Mountain were past, yet the struggle for Atlanta lay firmly in their future. That day, I had two scheduled book talks. One in Athens, at the Athens-Clarke County Public Library at 1 pm, and the other at the Atlanta History Center at 8 pm. Aside from some issues with Atlanta rush hour traffic, the day went very smoothly. The crowd at the Atlanta History Center was incredible, and the line for signing books seemed to stretch forever. I got to meet Gordon Jones, the chief military historian and curator at the Atlanta History Center, and if ever there was a guy whose generosity and kindness matched his reputation as an outstanding historian, it would be Gordon. Meeting him was one of the highlights of my trip. 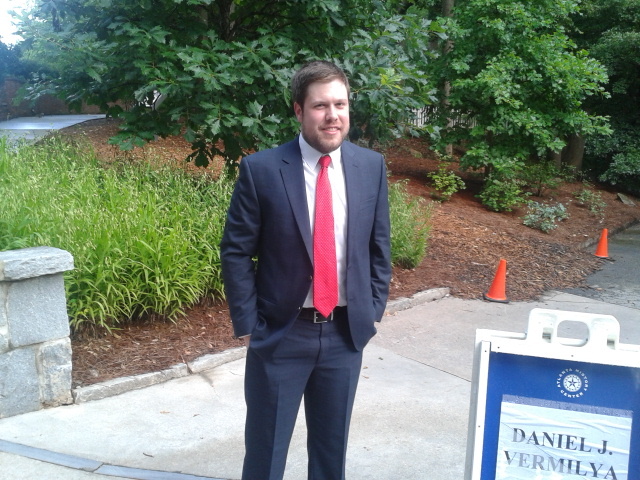 Me at the Atlanta History Center just before my evening lecture. 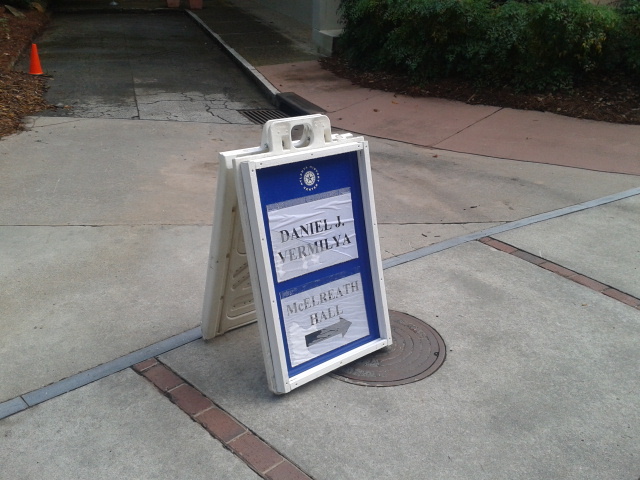 The Atlanta History Center had set up large signs directing visitors to the auditorium for my talk. On Friday, I was the first author to speak at the Kennesaw Mountain Visitor Center, where I spoke on Dan McCook and Charles Harker at Kennesaw Mountain, describing how two young officers had faced fearful odds and made tremendous sacrifices for their nation 150 years before on that very day. 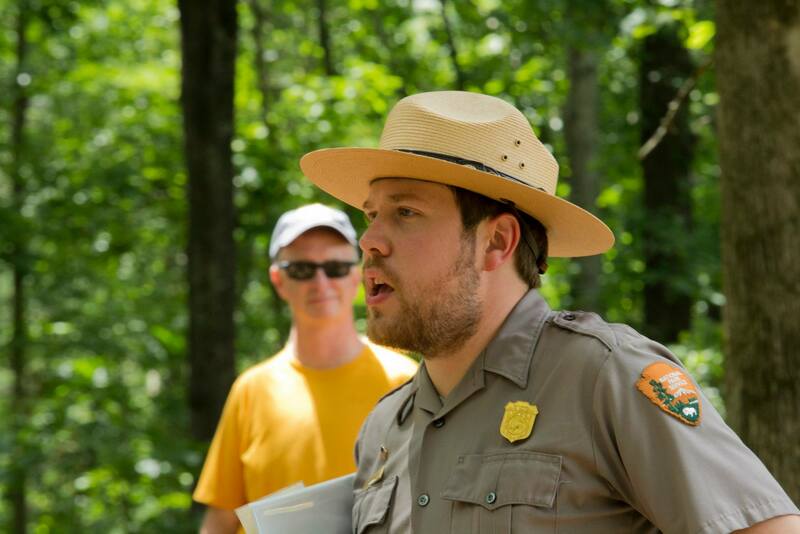 After the lecture, I made my way out to Cheatham Hill, where I began leading ranger programs for the park. 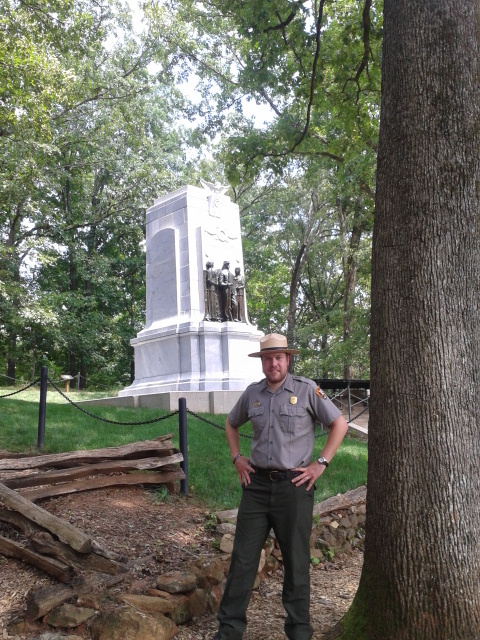 Being in uniform and talking with visitors at the famed Dead Angle 150 years after the battle was a tremendous honor. 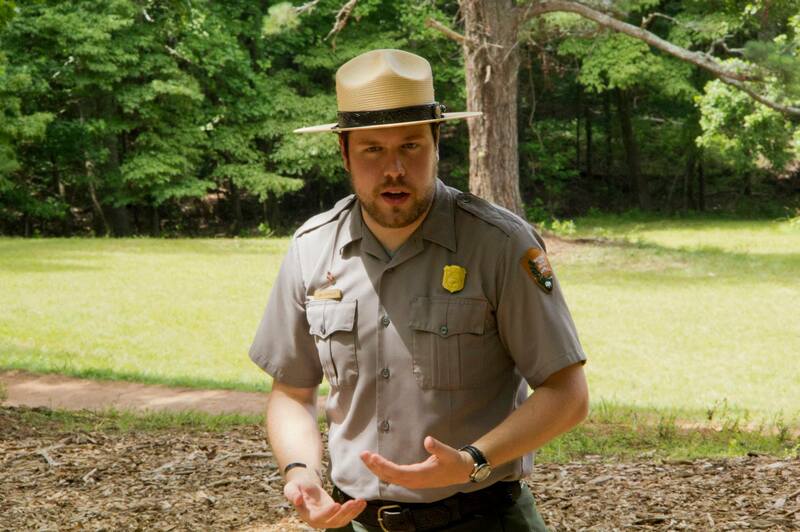 On Saturday the 28th, I was again leading ranger programs at Cheatham Hill, before heading off to Marietta for another book talk and book signing, this time at the Marietta Museum of History. Another great crowd came out, and it was a successful fourth book lecture in a three day period of time. All in all, it was a great week in Georgia. I could never have expected it would go as well as it did. I will post more in the days to come. Just wanted to put a few pictures on the page this afternoon. To all who I met in Georgia, thanks for your hospitality and your kindness. 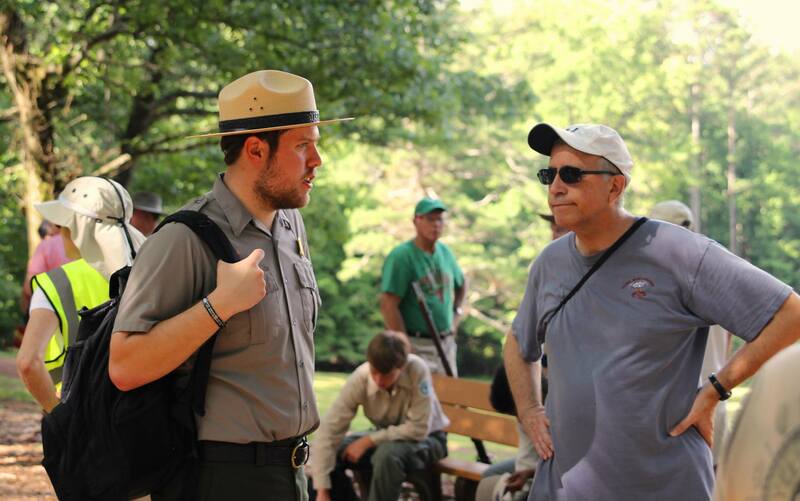 I will never forget this week and what a privilege it was to work alongside the outstanding staff at Kennesaw Mountain National Battlefield Park and how awesome it was to meet so many who enjoyed the book.